I'm totally with you, let's hold off on the coats. I've been layering up but holding out on the coat for now. Great classic look! 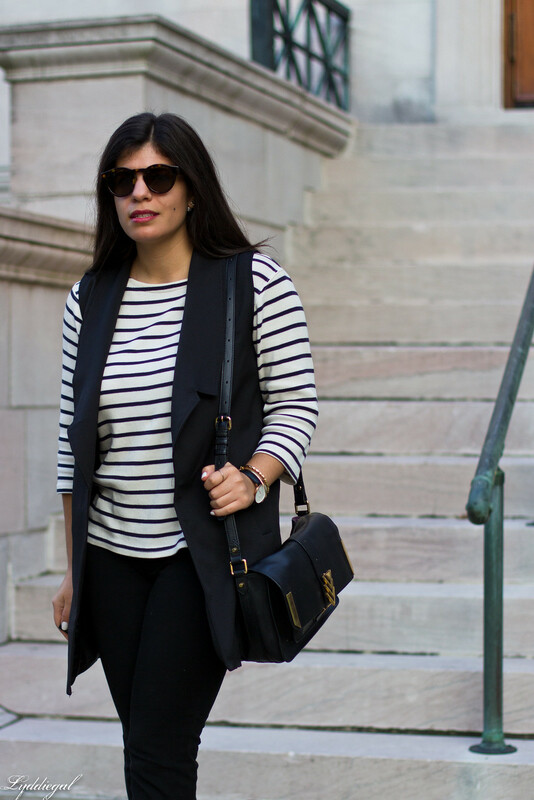 I'm a huge fan of these longer vest---really almost any time of the year. I think they can be work appropriate yet perfect for a casual look too!! I kinda feel the same way about my boots as you do your coats---I know they'll be getting constant use in the next couple of months, so I don't want to overdo it yet!! 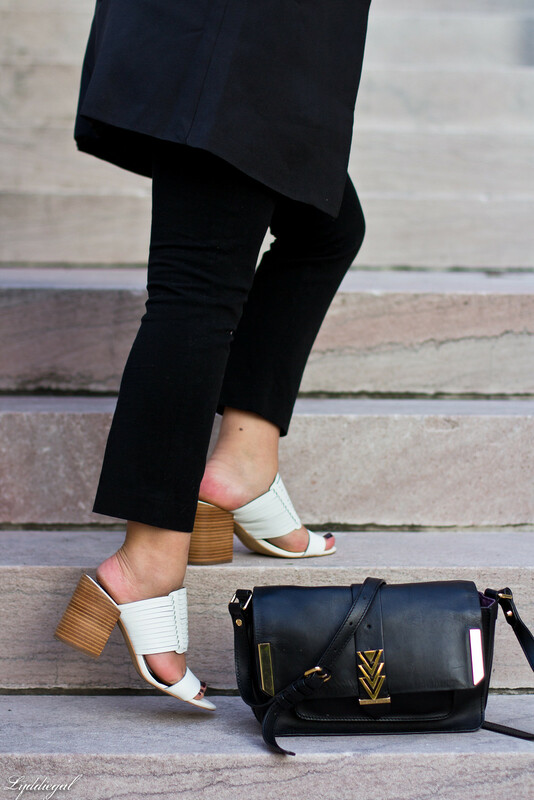 Love this classic black and white look, and how you are still styling the RM mules I also have -- must bust mine out! Haha, I'm doing the same thing with my coats! But I have one that has really thin arms so once I need to start wearing thick sweaters it will be harder to wear...so that one might have to come out with a tee under it. Loving this long vest...such a great look!! Such a pretty vest - I am kind of surprised you can still wear mules in this time of the year. I cannot believe October is over. You know I have a deep love for a good long vest - I bought mine sort of on a whim but it's proven to be one of my favourite things in my wardrobe, so practical in so many scenarios and stylish, too. 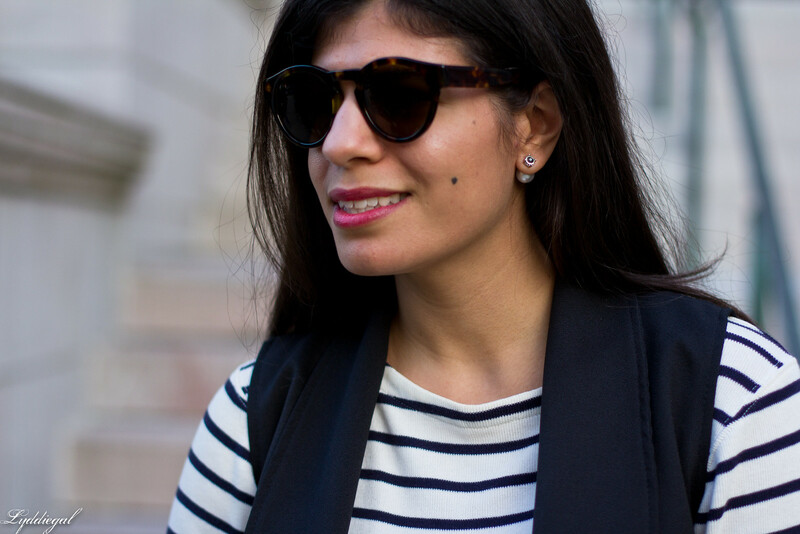 With that said, there are still so many ways that I haven't worn my vest and with stripes is one of them, so I'm going to have to take a little inspiration from you next time I style it! I am 100% the same way. Coats are all fun and games until you HAVE to wear them or else you will freeze. Even though I have quite the impressive coat collection as I am a sucker for a pretty coat, those things stay put until I NEED them. I love this vest! Very chic! I know the feeling, because once we're in coats, we don't come out for months. I love how you wore this vest for added warmth! I've been layering light jackets for now. Denial, indeed! 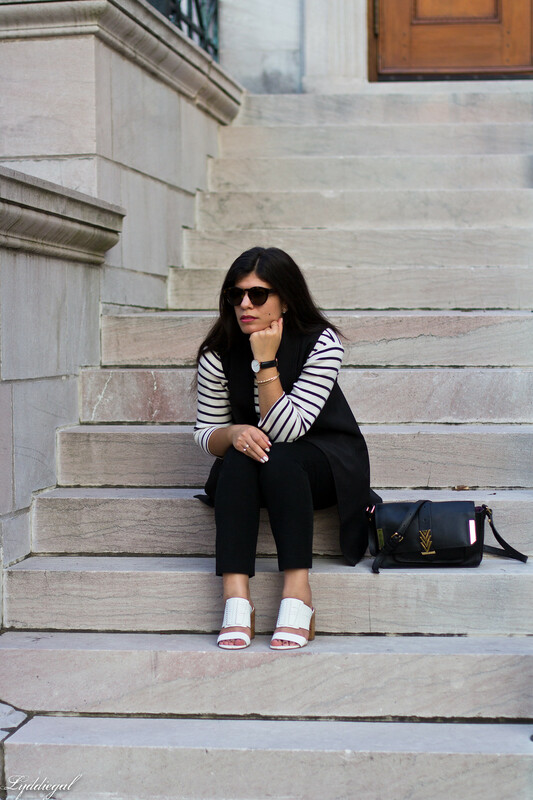 One thing i have noticed about black and white mixture is that its one of the most perfect colours to match together. They easily and simply fit. You look so pretty girl. 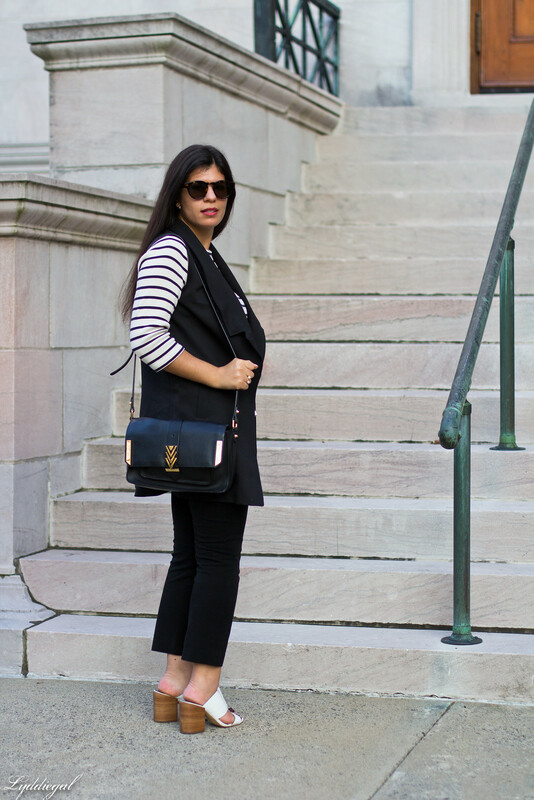 You styled your vest in such a classic and wearable way! Love it! I so love the look of these long vests, perfect on you with the stripes! It's amazing what a vest can add! Love it with your stripes. I've been on the fence about a long vest like that, but you wear it so effortlessly I think I need to give it a shot! This is such a chic look! What an amazing classic look dear! 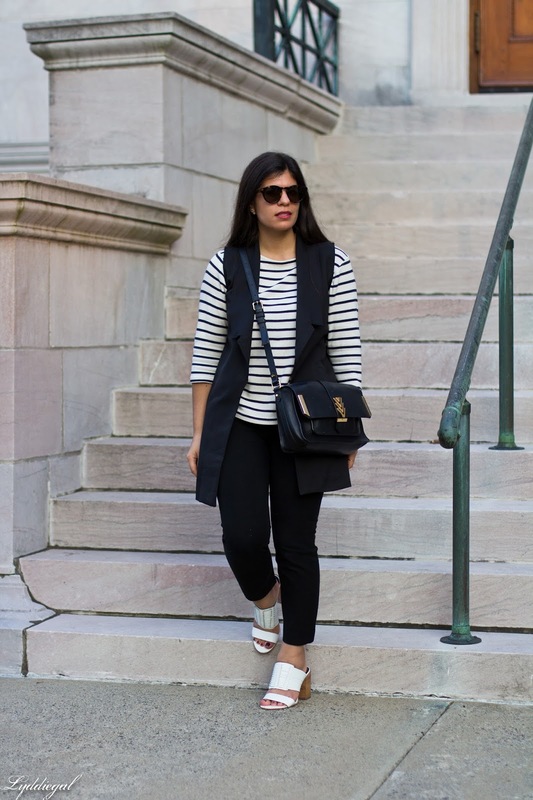 I love your Breton top and how you styled it! 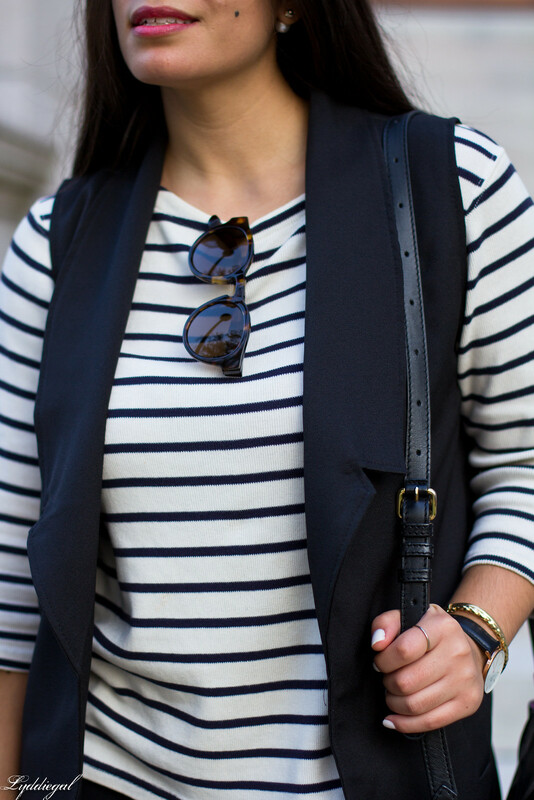 The vest is perfect and you have incorporated it so great into your look! I've been contemplating adding a vest to my closet and I just love yours - it looks like a really well-tailored piece. 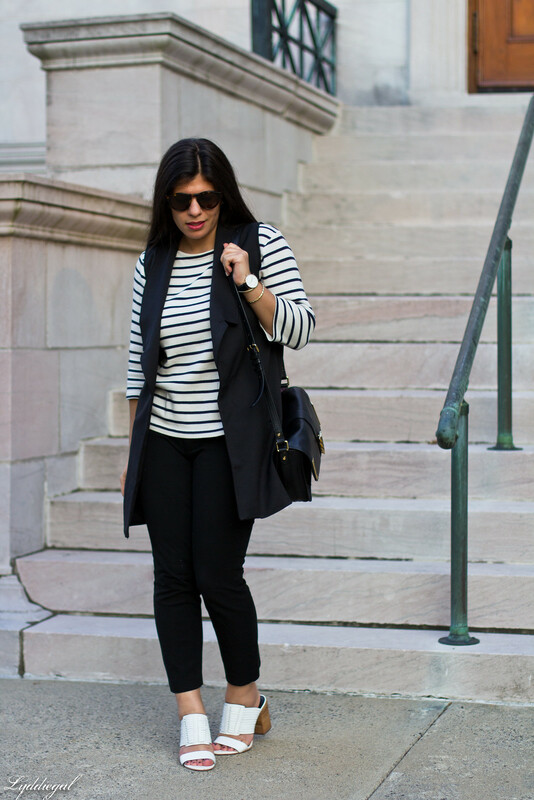 I always love stripes the most in the fall. It's just such an easy and chic look. 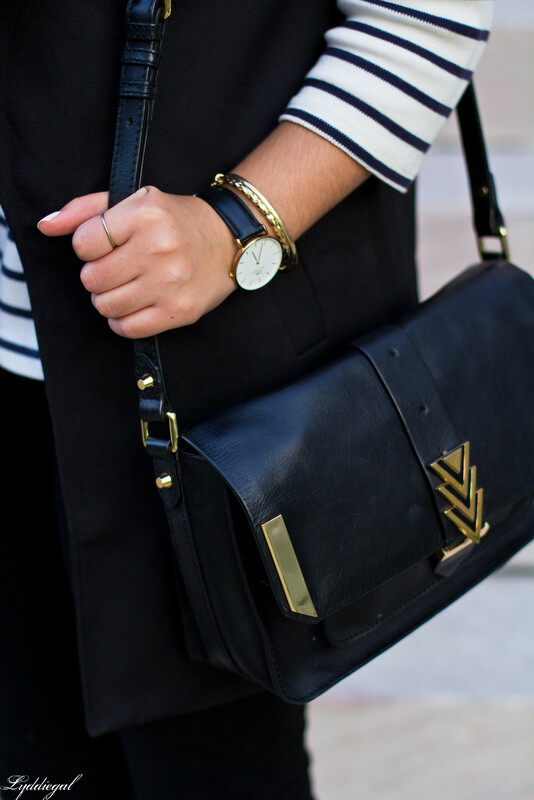 Major bag envy over here too! The long vest looks great. This is a great fall look.